From tracking screen time to phone-free Fridays, how schools are encouraging students to reflect on their tech use. For most tweens and teens in the United States, screen time is a constant, both in and out of school. One study shows that tweens spend 4.5 hours of time on screen every day, while teens spend 6.5 hours. But there is a growing backlash against screens in schools, especially as new research demonstrates the profound impact screen time has on brain development. With that said, schools are taking concerted effort to examine the use of tech, in some cases banning screens altogether. But since technology is not disappearing anytime soon, how can schools bring more mindful screen time into play? We took a look at some of the more innovative approaches across the country. Teachers at Miramonte Elementary in Clovis, CA, spend time teaching students important digital citizenship skills. Chief among them: that someone on the other side of the screen will read or experience whatever they post. Connecting students’ online actions to other people increases awareness of how their actions impact others. The #ICanHelp campaign offers presentations, workshops, and other resources for all grade levels to help start teaching the fundamentals of digital citizenship. A first step to mindfulness is understanding how often they’re using screens in the first place. That’s why teachers at The Agnes Irwin School in Rosemont, PA, have students track their social media time. Students are often surprised by how many hours disappear into the black hole of Snapchat and Instagram. Teachers can invite students track their online activity for one 24 hour period. (The new Apple Screen Time feature makes this easier if they are on iOS devices.) After they’ve tracked their time, talk about what screens are in their lives, how they’re using each, and how they feel during each activity. Building on the idea of tracking their time, students at The Agnes Irwin School reflect on how they’ve used technology by writing a list or drawing pictures to show the web sites they’ve visited, the apps they used, and the online content they created during the week. Bringing their attention to how students have used tech in school makes it a tangible part of their week, and helps them reflect on how technology helped or hindered their progress. Sometimes the best way to make tech matter is to take it away. When Randolph Middle School in Randolph, NJ started a BYOD policy the intent was to capitalize on the technology students already had. However, with devices came negative social interactions, and content that was not school appropriate. The school has switched to phone-free Fridays which has reduced screen-induced drama and focused screen time to classroom tasks, like Kahoot assignments and research activities. Teachers across Denver Public Schools are encouraged to think about how their students are using technology, ensuring that each activity falls within one of four buckets: Engage, Personalize, Measure, and Create. When students are engaged in tech, they’re using media to learn in ways they can’t in a traditional classroom setting, like taking a 3D tour of a cell. Tech also personalizes learning, helping students learn through differentiated activities. Teachers get quick measures of student progress with check-ins and mastery assessments. And, technology allows students to create everything from web sites to games to show what they know. Setting these guidelines and creating conversations around them helps to focus tech use and limit screen time that might otherwise be better spent offline. Teachers at The Agnes Irwin School use Calm.com to help students take mindful breaks during class. Calm.com is a mindfulness web site that has a lessons and mindfulness meditation activities for K–12 students (sign up for a free Calm for Schools subscription). Using Calm.com before students work helps them practice awareness when they engage with tech, says Maggie Powers, Director of STEAM Innovation. At the Ann Richards School, teachers also have students focus on something offline in between activities that do use screens. Use a visualization activity, like having students close their eyes and imagine breathing a color in and out, for example. “We find that checking off of a screen and being in the moment is restorative,” says Howk. Laura Hart, principal of Miramonte Elementary, knows that the people who will eventually hire her students want them to be collaborative, cooperative, and tech-savvy. So, she works to structure her students’ screen time around those goals. In sixth grade, students build a business from scratch, including the idea, a business plan, and a budget for everything from materials to health care costs. The students work collaboratively to research, gather data, and create a PowerPoint that explains their idea. Connect what students are doing today to how they’ll use tech in the future to make screen time more purposeful. 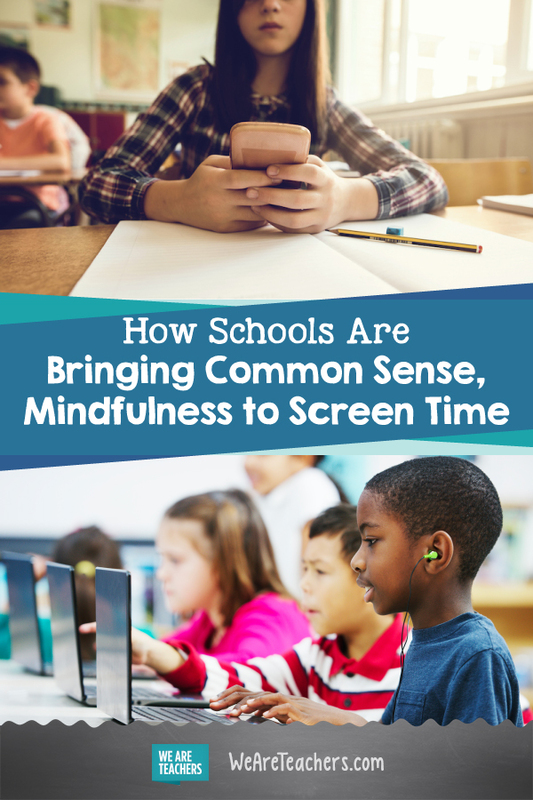 We’d love to hear—how does your school encourage more mindful screen time? Come and share in our WeAreTeachers HELPLINE group on Facebook. Plus, what kids want teachers to know about video games.